Viewing Lenin's body lying in state in one of those truly bizarre travel experiences made even more surreal by the fact that you're not allowed to take any photographs. All you have left are your memories - memories of viewing a very dead body in a very dark room while surrounded by men with very big guns. I guess SOME photography is allowed after all. Lenin has been on display almost continuously since his death in 1924 (he was moved for safekeeping during World War II) and it's creepy to think that his dead body has been out and about (almost 90 years) for almost twice as long as his live body ever was (he died at age 53). Stalin's body was placed next to Lenin's after his death but removed in 1956 as part of Khrushchev's de-Stanlization of Russia. 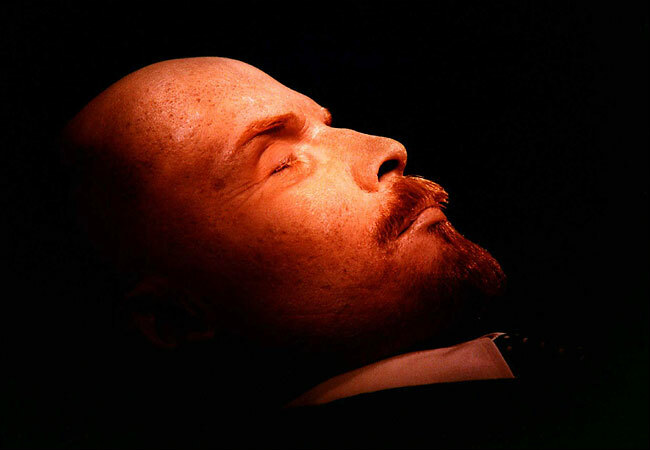 In the past few years there has been an increasing debate about whether to finally bury Lenin's remains. Some see him as a visionary, an almost deified father of modern Russia, while others insist that he was merely a totalitarian ruler responsible for mass murder. Even Lenin's cause of death is now in question. Although he ostensibly passed away as the result of a series of strokes, new evidence points to advanced neurosyphilis. (This a really, really bad progression of an STD). Among the many guards at Lenin's tombs, however, there appears to be no room for debate. Viewing Lenin's body is an absurdly solemn and strict affair. We had to check our bags before we could get in line, and when we were finally allowed in we were directed through a maze of winding corridors and stairs. At every turn was a stern armed guard hurrying us along and admonishing us not to talk (we weren't talking). Finally we entered the small, dark room that held Lenin's body in a glass case. He looked fake, waxy and extremely tiny, and when Dave and I paused to drink in the view we were immediately yelled at by the guards to keep it moving. This was especially odd since we were literally the only people in the room and it certainly wasn't like we were holding anyone up. However, we didn't want to end up dead like Lenin so we obeyed. A few more twists and turns and we were back out in the gray rainy dampness of Red Square, wondering if that had all really just happened. If You Go: When we were there last August, Lenin's tomb was only open Tuesdays, Thursdays and Sundays from 10AM to 1PM, so check the times and plan accordingly. The visit is free, although you'll have to pay to check your belongings. Be prepared to spend a lot more time waiting in line than looking at the body!